Shirdi Sai Baba Stories,Leelas and Teachings. : Shirdi Sai Baba's Grace-Experience Of Sai Devotees-Part 42. Shirdi Sai Baba's Grace-Experience Of Sai Devotees-Part 42. Though Baba lived a life of a humble fakir but He is truly a God incarnation whose extent is limitless and beyond time and space.He is omnipresent and resides in the heart of His children .Anybody who calls for Him with earnest devotion ,feels His presence around him showering His grace,guiding him and protecting him .Today we have few devotees sharing the same feeling with all of us .Jai Sai Ram . Thank you for this wonderful site and for the divine book Ram Vijaya series its very interesting. May you and your family always be blessed by Baba. This is my second time writing, in-the first being sometime ago with pictures of Baba appearing in the sky on Full Moon night. Last month for Full Moon too I saw the same thing happen. I was so touched with the last sharing in Part 41 of the Experiences today and to know that Baba has appeared on 13th April 2012 in the Moon again. Baba is so alive around all of us. We are all so blessed. Today I would like to share about an accident that happened to me last week. I fell and fractured my foot on the 19th April - Baba's special day after spending the whole morning in my pooja room. I was feeling very miserable, frustrated and sorry for myself after the accident as all my plans had to be shelved for the next 3 months as I would be immobile. Most of all I would not be able to do my daily pooja in pooja room and go to Baba temple which I do several times a week. Could not understand why it had to happen to me? I was feeling angry at Baba for putting me in this situation. On 20th morning I was sitting in front of my computer watching the live darshan from Shridi and crying to Baba asking Him to help me through all this as I am alone most of the day and it is so difficult for me to move around as we live in a double story home and the family is away at work all day. There is no one to help me in the day. Later that morning when I opened my email and read your mail about all the experiences - the first thing that appeared to me was this picture below with all those beautiful words. Now I always feel Baba holding me through this difficult time and I have full trust in Him. I continue to pray that I will not have to go through surgery and this will heal on its own. I also know that this accident has now taught me to be more patient with many things around me and to appreciate what I have always taken for granted. 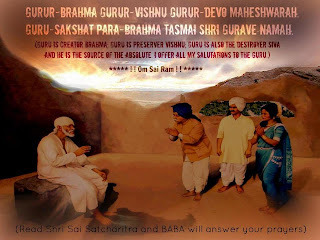 In Sai Satcharitra it says "Let us have Sharadha(faith) and Saburi(patience) for His Grace." I also understand the meaning of going through your Karma that is mentioned in Sai Satcharitra. The result of our past actions have to be suffered and got over and whatever comes to us Allah(God) is the sole Dispenser and Protector so always think of Him and He will take care of us. Surrender to His Holy feet with body, mind and soul and enjoy what we receive in return? This accident has also given me a chance to spend so much time on my music and books about Baba and to sit in silence and in meditation more and enjoy nature around me. I feel it is a time of reflection in my life. I have a beautiful view from my room and I never stopped to notice the beautiful things Mother Nature has given us. Now I have all the time to do this. I have learnt to appreciate the little things in my life. Most of the time I am charging around for everyone else and always thinking of myself last. I feel this is Baba's way of telling me to slow down and take care of this precious body and soul. I feel something has changed since this accident, and whatever challenges, obstacles and hurdles that come my way - Baba will be holding me through it all. How Blessed I am? Thank you Baba. I love you. And thank you Sister Manisha - I love you too. I am staunch devotee of Saibaba from past 5yrs. 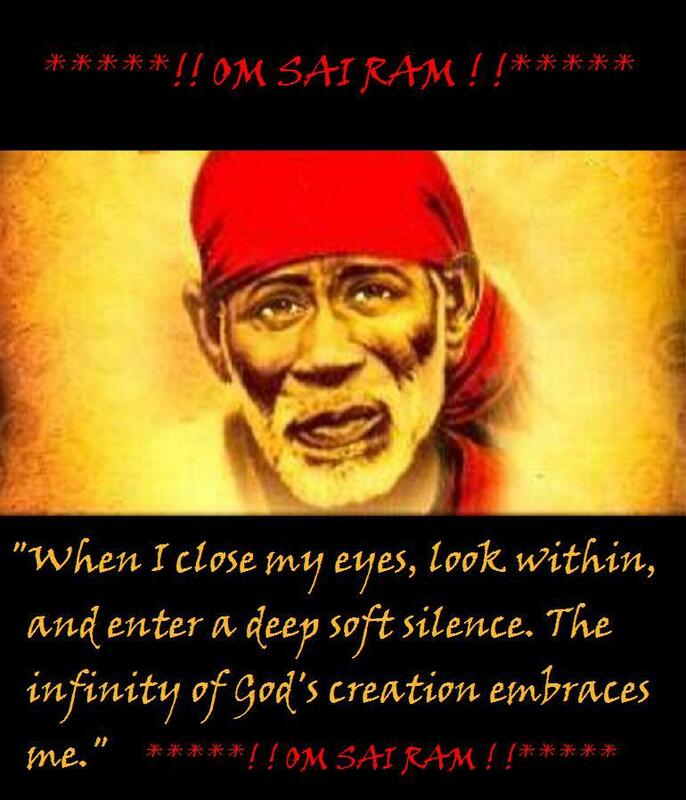 I have experienced presence of Saibaba many times infact every moment in my life. 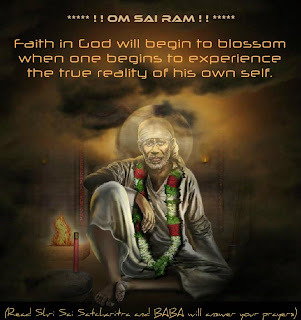 I am realy thankful to Saibaba for helping you to create such a wonderful website where devotee share their real experience with Shirdi Sai Baba. Last month April end I went to Shirdi. From the time of planning the trip to go to Shirdi till the time I reach back home Saibaba planned everything for me in very beautiful way which I did not even think before leaving to Shirdi. From the month of January '12, I was thinking to go to Shirdi for Saibaba Darshan but due to some or the other reason I could not make it. Finaly that time came. Whenever I think of Shirdi my mind is filled with happy thoughts and all the tensions vanish. How lucky those people are who live in Shirdi. I took decision to go to Shirdi by March end. 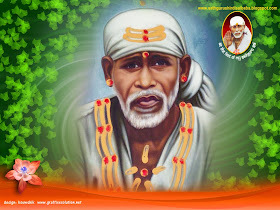 I had some financial problem which was sorted out by the grace of Saibaba. This was the first miracle I would say. Then I thought of booking of the accommodation for us. Before booking I took permission from my boss for grant of leave for 3-4days in March '12. When he asked me the reason for leave I told him I am going to Shirdi. When he heard about Shirdi he said you do not worry I will arrange for your complimentary accommodation at Shirdi as I am working in a Hotel industry. This was the second miracle. Even though I had financial crunch Saibaba blessed me with good 3 star accommodation so that I have comfortable stay at Shirdi. The Hotel which was booked for us was just 2 minutes walking distance from the main Sai Temple. This was amazing experience. Now third was to book bus tickets. My cousin booked going tickets only and he did not book return tickets. I visit Saibaba temple nearby my village every Thursday. One Thursday me and my friend decided to go for evening aarti in Sai temple. Normally I go morning to do Abhishek pooja. So that day me and my and friend, both went evening also. I had a wish to buy one Saisatcharitra and read everyday but I was little bit confused as whether we can keep it at home or not and are allowed to read only in temple. We happened to meet one person who happened to be far relative of my friend. He is also a strong devotee of Sai Baba so we thought of asking him about reading of Sai Satcharitra. He said you can keep it at home and read it. There is no harm in that but must not read it after eating anything non veg. I was so happy to know that. So immediately i decided that I will buy one Sai Satcharitra for me when I personally visit Shrdi and I will start reading it from Shirdi Samadhi Mandir itself.! After this we told him we are going to Shirdi on next Tuesday. He was happy to listen this and he asked whether we have booked accommodation, bus tickets and all other details ... We said we have already booked bus tickets for going and accommodation but have not booked return tickets. He told us we better book return bus tickets also so that we do not face any inconvenience when we are in Shirdi and can have peaceful Darshan and stay at Shirdi without any worries. And due to Ram Navami it is likely that there will be heavy rush and we might not get bus tickets .He said if you all require he would arrange bus tickets for us. We agreed and did return bus tickets booking through his help. This was third miracle Sai Baba did for us. You can see how Sai Baba thinks and takes care of everything children and makes sure they do not face any problem. We were suppose to leave for Shirdi on Tuesday 27th March '12. Now see what happens. Exactly on 25th March my sister's newly born son one of the blessing of Saibaba whom we have kept name as Sainath (Age just 3 months)felt sick and had high fever. So we took him to Hospital and doctor asked him to admit him in Hospital. Doctors took his blood and urine reports. We got urine report and it was told to us that he has got urine infection. Doctor said we will get blood reports on Thursday. Saline was put for him and he was crying bitterly with pain. Just imagine how painful it will be for such a small poor infant to bear such a pain. I applied udi to his full body and went to nearby Saibaba temple and prayed to make him completely alright and let his all reports come normal. We all kept on praying with faith on Saibaba. He was recovering but again suddenly any time fever was returning. Looking at him I and my sister was crying as we could not see him bearing such hard pain. Sunday, Monday passed and Tuesday came. I was feeling very tensed and my mind was also double minded now as whether to go Shirdi or whether to leave him in Hospital. Then i made up my mind and took permission from family and they said you go without any worries and pray for him at Shirdi nicely to Saibaba. Actualy Saibaba had already given me signal that I do not have to worry at all and Saibaba will take care of all the things. Just think when Doctors said we will get reports by Thursday which is day of Saibaba. This was positive sign from Saibaba. But since we are humans we have tendency of worrying but still I had full faith in Saibaba. Tuesday night we boarded the bus and reached Shirdi next afternoon around 11:30am. We reached Hotel and to our surprise we were given a room which was on top floor and just outside our room they had made nice replica of Sai Samadhi Mandir. I felt blessed and happy to see Saibaba moorti and Samadhi replica just outside our room. After that we had bath and breakfast and went to Saibaba Samadhi Mandir straight away. It was around 1 :00pm. There was no rush and we had nice darshan and I was also able to touch Sai Samadhi. Most of the time it is not possible as they put glass near samadhi. After that we went to Dwarkamai also. I prayed for my sisters son all the time. And was chanting Om Sai Nathaya Namaha....all the time throughout day. After having darshan all around we went in room and again came back to temple for Mukh darshan and then we went to buy Sai Satcharitra. I bought one copy for me. I had a wish to perform abhishek pooja next day ,that is on thursday in Sai Temple as I never miss that when I am home. But I checked everywhere but could not locate how to go about it for booking and other details. So we came back to room to kept the things which we bought and just when we reached in our room, my friends phone started to ring. This call she received was from that same relative who booked bus tickets for us. He enquired everything is fine and all and if any help is required. He also told us not to miss kakad aarti and Abhsihek pooja on Thursday. Just imagine what a right time he called to help us. We asked him how to book for abhishek pooja and related details. He told us to go Sai temple right now and enquire there to police. They will guide you and also said for kakad aarti you reach Temple and stay in que by 12:00 midnight itself so that you will reach inside the temple early morning. We did same thing. We booked tickets for abhishek pooja for 2nd batch at 9:00am and we checked where abhishek pooja is done . Then after evening arti we went to Prasadalaya to eat food. We reached back to room at 10:00pm and we went to sleep. I kept my alarm at 11:30pm, my cousin kept it at 11:45pm. Since we were very tied all got slept quite soon. First my alarm rang at 11:30pm. I switched it off thinking i will get up in 5 min. But i did not wakepup again. Then my cousin's alarm rang and he too switched it off thinking same thing. After that in another 5 to 10 min someone started banging our door. We woke up and I shouted and asked whose there ? But nobody replied and kept quite. We again thought of sleeping little more. After 10 minutes again someone started banging our door and this time it was more harder. We got all scarred and got up and sat on bed. Again we shouted but it was same story nobody replied. Then I called upon reception and asked them that please send security guard as some one is troubling us. After 5 minutes call came from reception and they said we had left our key at door and that time their housekeeping boy was passing from that side so he banged door. Reason can be anything but I am confident to say this was final alarm of my Sai Baba to wake up or else we will miss the kakada aarti. Then we all got ready and went to Saibaba temple and waited in que. I took my Saisatcharitra along with me thinking I will touch it to Saibaba Samadhi and take it home. When we sat in que I thought of reading it and I finished almost 6 adhyay of Saisatcharitra. I was feeling very relaxed and all my tensions were gone. Then we attended kakad aarti and then morning abhishek pooja. While doing abhshek pooja in my mind I said to Sai Bab atleast now you make my Sister's son alright. Let all his reports come normal and relieve me completely from this tension. After that we went in room and another miracle was waiting for me. I checked my cell and I received text message just 10 min back that Doctor told our small boy to go home today and reports are also normal. This was Thursday the right time Sai was waiting to make us happy. You can imagine what the condition would me at that time to read such a lovely message. Really Sai relieved me from that tension completely and that day the little one was discharged by afternoon. And after that he became completely alright and is back to normal now. 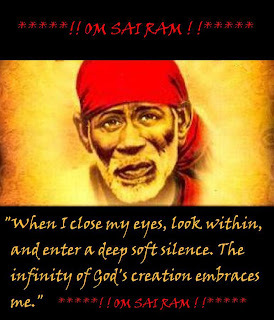 That Thursday was blessed day for me and my every wish Sai baba fulfilled when I was in Shirdi. Such a nice lesson it was Shradha and Saburi. When the right times comes Saibaba give us what we ask for. Then next Day on Friday again we went Sai Samdhi Mandir and prayed and left back to home. Journey was beautiful and memorable for me which I will never forget in my lifetime. 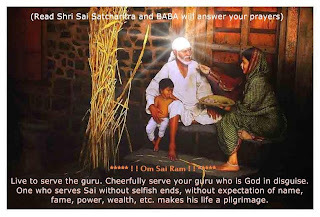 Whenever I prayed to Sai Baba even like other devotees I never got negative answer from Saibaba. He has always answered my prayers even smallest to smallest and toughest to toughest. I always feel I am very lucky because Saibaba is always with me and and I also feel I must be one of the favourite child of Saibaba. His presence is everywhere and evertime is with us. I love you Saibaba. I would like to share my experience with Sai. Kindly post it in website and donot reveal my name. Yesterday (Apr 26th) I have completed my second 9 days vrat. First time when I completed my vrat, on 9th day I went to Shri Naga SaiBaba temple, Coimbatore attended noon aarti and offered prasad to baba and distributed it to the poor people. This time I was not able to visit temple on 9th day. I couldn't prepare any sweets also for baba that day. So I gave money to our maid and asked her to buy some sweets and distribute to the children residing near to her house. She is residing in the village area where lots of children living. So I did this and also asked baba to pardon me(although its baba's plan to distribute sweets to those children) as I couldn't visit his temple and distribute the food. Today when she came for work, I enquired her regarding the sweets. She said yes and told me an incident happened, after hearing which I was really happy. Here goes the incident. While returning to home she bought some sweets and when she reached home, a small guy, who is a muslim came to her home and asked for sweets. She gave one and again he asked for one more which also she gave and the boy left happily without uttering any single word.She is also a baba devotee. She realized that it's baba who got the 1st sweet. She was very much happy for he accepted the prasad and after that she distributed the remaining sweets to other children. After hearing this I thanked baba for being with me and for his love. Also today morning when I came out of our shrine after finishing the prayers, I got some sweets first to eat(which is a prasad from our near by temple). How kind and omnipresence our baba is!!! I am speechless to express about his leela, love and care. Thanks for sharing such wonderful experiences with us.